Syed Mushtaq Ali was an Indian test cricket player who was the first Indian cricketer to score a test century overseas. He achieved this feat when he scored a century in 1936, at Old Trafford in Manchester against England. In that tour, scored four first class hundreds and became a Wisden Special Award winner. He was a right handed aggressive batsman and a left-arm low orthodox bowler. He was an opener and a middle-order batsman. He was more than a sporting legend; he was a popular superstar of his time, and a youth icon for the younger generation of India. He was awarded one of the highest civilian award, the Padma Shri in 1964 by the Government of India. Ali was discovered by CK Nayudu at the age of 13 at Indore. Nayudu was impressed by his skill and became his cricketing mentor. 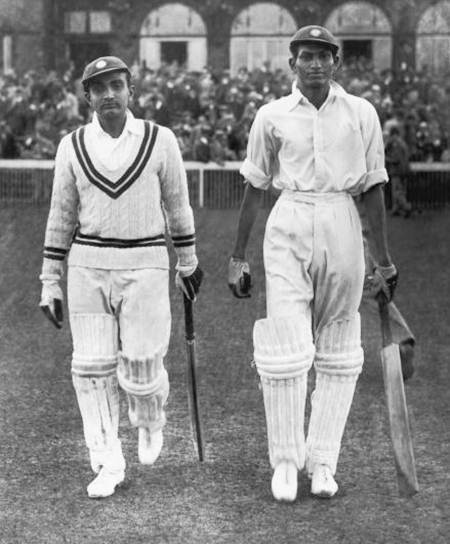 Although a very promising batsman, he could not play much international cricket, due to the World War II. He could play in only 11 tests. He scored 612 runs including two centuries. 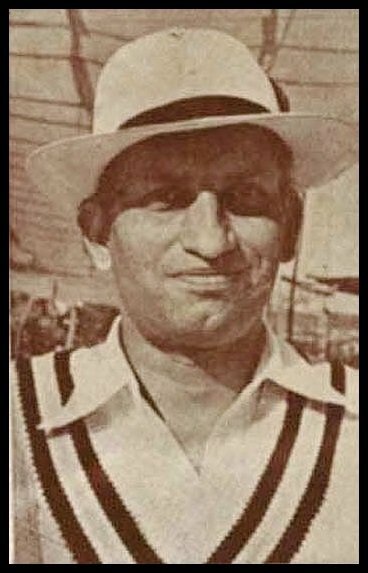 He made his debut in the Kolkata Test against England in 1934 and played his last Test against England at Chennai in 1952, when he was 38 years old. In 11 Test matches from 1934 to 1952, he scored 612 runs at an average of 32.21, with two centuries and a high score of 112. He took three wickets at an average of 67.33, with a best bowling analysis of 1 for 45. Ali made a powerful team of openers with another cricketing legend of the time, Vijay Merchant. The cautious yet skilled Merchant and the aggressive and powerful stroke-play of Ali made for a dynamic and legendary opening partnership for the Indian team for years. He played extensively for regional team and private clubs when Test cricket in India was still young. In the Ranji Trophy national championship, he played for the team Holkar along with other stalwarts like CK Nayudu, who was his mentor. He was honoured with a life membership of the Marylebone Cricket Club (MCC) for his contribution to the game. Indian cricket team on England tour, 1936. Mushtaq Ali, seated on front row, extreme left. At the age of 90, on 18 June 2005, he passed away peacefully in his sleep, never to wake up again. A mournful nation of cricket-lovers sent their condolences. He is survived by two sons and two daughters. Mushtaq’s son, Gulrez Ali, and his grandson, Abbas Ali, both played first-class cricket. Mushtaq Ali played in 226 First-class matches, and scored a total of 13,213 runs at an average of 35.90. He scored 30 centuries and 63 half-centuries, and a highest score of 233. As a bowler, he took 162 wickets at an average of 29.34, with a best bowling analysis of 7 for 108. In his honour, the Indian domestic T20 series, Syed Mushtaq Ali Trophy, is named after him. This domestic championship was started in 2008-09 by BCCI, and is played among the teams from Ranji Trophy. Mushtaq Ali continues to be a popular figure and a legend in Indian cricket.